but this Wailea tree is covered in white birds. Even gilded Wailea has patches of wildness with kiawe trees, spear-shaped agave plants, and prickly pear cactus across from multi-million dollar homes. Around sunset, there is one very curious sight: flocks of white birds all flying to one and only one tree. There are hundreds of trees in the area, but this is the chosen tree they roost in for the night. Towards sunset, this tree becomes decorated with white birds landing, flapping their wings, jostling for perches, and settling down. I think they are cattle egrets, but I've never gotten close enough to find out. 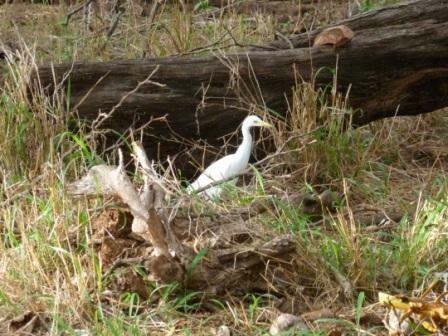 Cattle egret at Makena State Park. Why this tree and none other? Is it the special location in the maintenance area of the Makena Golf Course. Do these birds like to golf? How much bird poop do these birds produce? Why do they like to sleep in crowded conditions? These are all the curious questions that go in my mind while driving past what I've come to call the "White Bird Tree." I tried to film it recently, but without a super zoom camera, it looks like flying toilet paper settling into a tree.